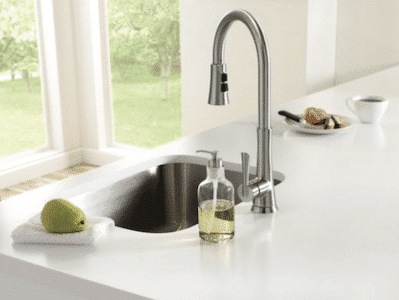 Whether you prefer the open space of a single bowl or the division of a double bowl for your kitchen prep and washing, we have an array of sink and faucet types and styles in a number of finishes. From kitchens and baths to laundry rooms and anything in between, you can find the plumbing fixtures you’re looking for at Construction Resources. Before choosing a brand or finish from the many options available, you may want to narrow down a style for your kitchen or bath sink first. Do you prefer the open space of a single bowl or the division of a double bowl for your kitchen prep and washing? You might like the traditional look of a drop-in sink over the more modern apron front or vessel style. Our product specialists can help you select the ideal sink for your needs and design, and they’ll even take care of scheduling installation. A double bowl 60/40 sink features two different sized basins. The division is perfect for prepping and cleaning during cooking or washing and drying dishes. A single bowl sink has just one basin and can make cleaning large dishes much easier. Also available in compact sizes, this option is ideal for situations where space is at a premium. The defining characteristic of a farmhouse sink is a large, forward-facing side that replaces a section of the counter and cabinetry. They are available in single and double basin styles. Smaller than a regularly sized kitchen sink, bar sinks are usually single bowl and are installed in an island or bar area for food/drink prep. A vessel sink is a basin that sits above the countertop surface, offering additional height from a traditional sink installation. Traditionally, sinks have been installed from the top-down. Undermount sinks are the opposite: the sink is attached to the bottom of the counter. Also known as a top mount, drop-in sinks are the most common type of sink and have a lip or rim that sits atop the countertop cut-out. Stainless steel, polished chrome or oil-rubbed bronze? Knobs, single-handle or touchless? Choosing the finishing details for your kitchen or bath can feel like a feat. Our design consultants will ease the selection process by helping narrow down the options that are right for you.